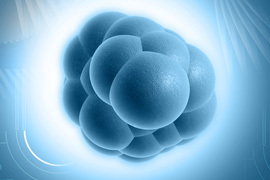 Stem Cells are the body’s natural tissue regeneration and defense mechanism. They are made in everyone’s bone marrow, the normal “inside” space of every bone. When harvested and properly processed, they can be used to regenerate ANY tissue in the body, when given the right circumstances and protein signals. This REPLACES the need to harvest actual bone or soft tissue from other parts of the body, which can be quite painful, prolonging recovery from surgery. Dr. Raska, through many years of research, has personally developed a technique in hard and soft tissue (Bone and gums) regeneration that utilizes the patient’s OWN naturally occurring stem cells. Under IV anesthesia, a tiny needle is placed through the skin over the hip, and gently passed into the marrow space of the bone. The bone is located very superficially to the skin, making this process very easy to perform. Marrow blood is then drawn off, passed through special filters, and placed in a special centrifuge to separate the stem cells from the rest of the blood. This is what is known as BMAC- Bone Marrow Aspirate Concentrate. Once they are separated, they are seeded onto sterile, donated bone, and a special bone protein signal is also infused. This signal tells the stem cells to become “bone-forming” cells. This technique allows Dr. Raska to rebuild the bone structures of the jaws and face, with minimal to no discomfort to the patient from the harvesting procedure. For more information about Stem Cells or to schedule a consultation with Dr. Raska, call our office in Sarasota, FL at Implantis Oral & Facial Surgery Center Phone Number 941-923-0033.